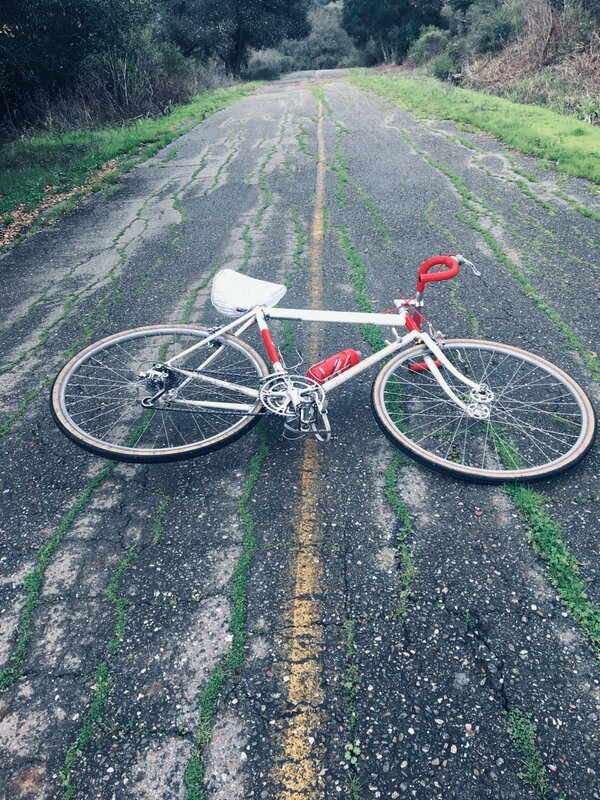 Unofficial Eroica California 2019 BF C&V Thread - Reg, info, roll call and more! Sorry for the query, but can't find a good information source beyond the official Eroica site. My question is this: the Brooks saddle on my Nuovo Racing is long since dead, but being vegan, I really don't want to have to buy another leather one if I can avoid it. 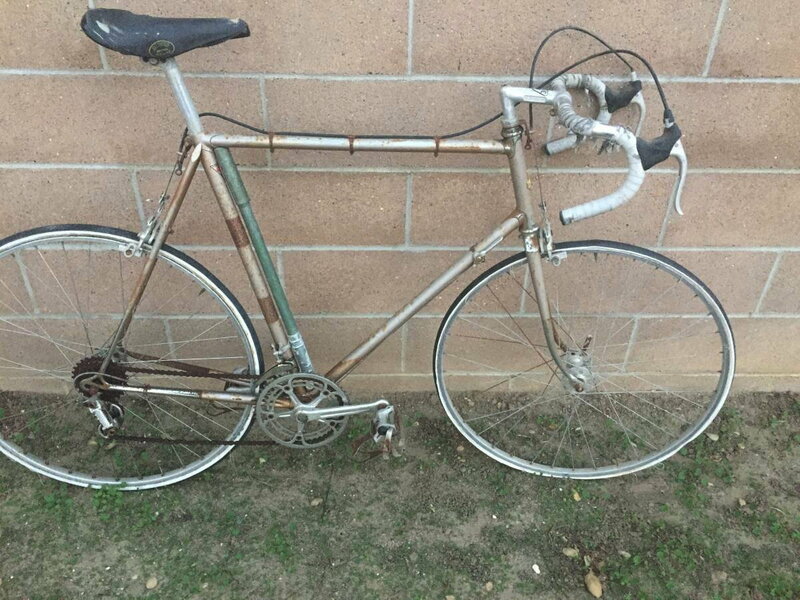 Am I SOL for any Eroica, or do I have recourse? I've used a mid 80's Vetta Gel saddle and its worked well for me. 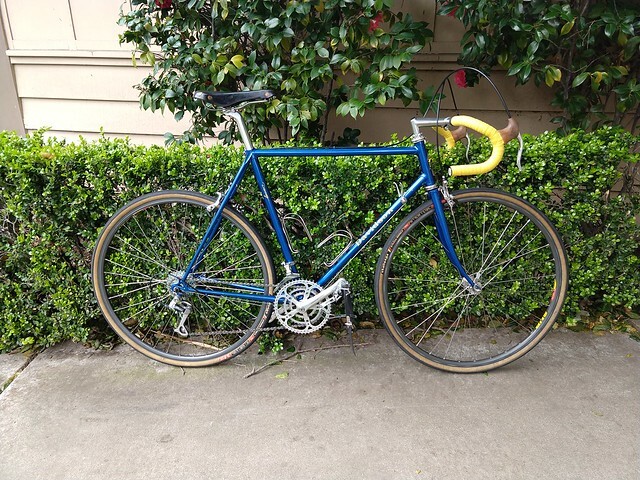 I never rode Brooks on my Italvega, but I have picked up a used pair of them to try, just don't think I can get them dialed in in time for Eroica. As mentioned, virtually any vintage shaped saddle out of any material is sufficient. Unlikely though to get a thin highly cut out modern or modern looking saddle to pass muster, although honestly, there isn't any specific bike inspection and qualification by Eroica staff. Riders are expected to reasonably comply with equipment requirements in the spirit of the event. 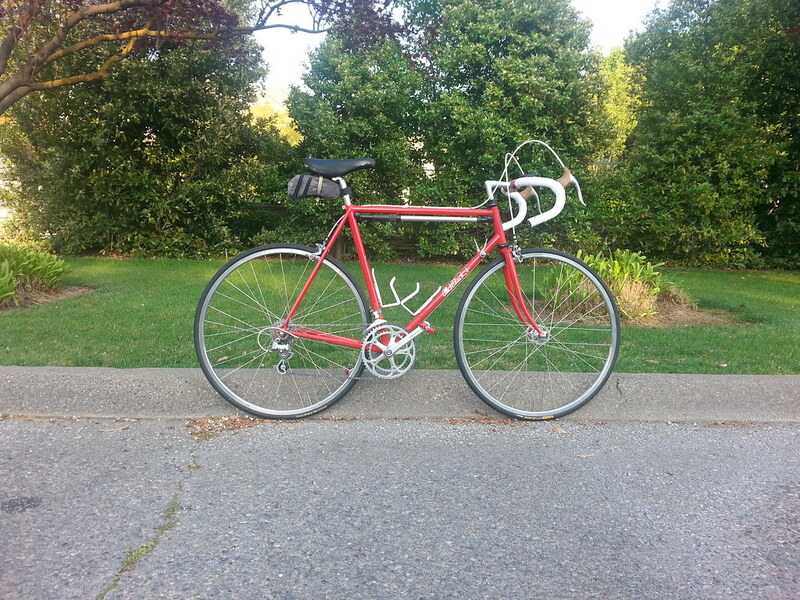 I have a friend in Portland who may have some spare saddles, I'll contact him and see if he'd be able to contact you. Gugie and AndyK are also in your area so plenty of BF members in Portland who may be able to help you. You might want to post a WTB (want to buy) saddle request in the Classic and Vintage Sales forum and see what pops up. 1981 Ron Cooper...my "new" bike. This photo taken two weeks ago while riding in rain and hail (making me a "badass" according to Rule #9 ). Note the highly customized saddle rain cover, courtesy of the hardware store. We will be staying in an Airbnb house a few blocks south and west of the Gugie Palazzo (and we will be sure to drop by to check out the party). Seems like you could get a used one and avoid your dilema well enough. I realize it would not be perfect but you would be recycling one that may not get used. You will be fine with any Brooks at Leroica, if you have others that are working for you I would just move one over, no break in, no muss, no fuss. You can also post in, In Search Of thread, you might even find one in town. I have a bunch, but they are all in play. I see you are in PDX, did you ever make it to Velo Cult for any of the shows? I like mine, I like that it's weather-proof and not leather; I use it on my commute bike. But it's not exactly vintage looking. The solution is to sit on it. Everyone will note the vintage rider, and nod accordingly. My Windsor Pro is light blue. Will be staying in Paso Robles agaion with friends, so more driving this year than last year. I will also be selling at the swap with Gabriel Salcedo from Sacramento. 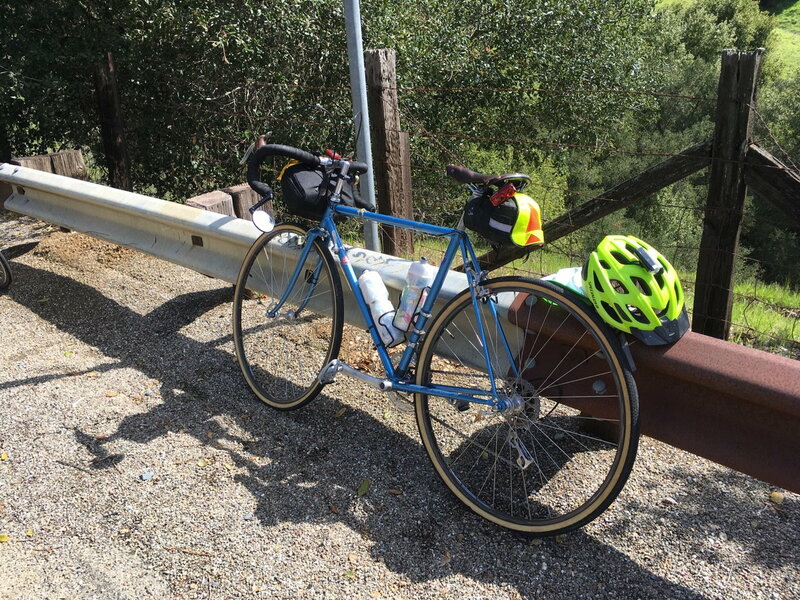 Top of Palomares Road, near Castro Valley, CA. SAT, 3/23/19. This year I'll be riding a late 1980's Eisentraut Rainbow. 52-39 chainwheels and 13-26 cassette should be plenty for the short course. Heinz 57 group with Turbo saddle on a Campy seatpost, Dura-Ace single pivot calipers with 600 levers, 600 crankset, Dia-Compe ENE downtube shifters, and a SunTour Cyclone rear mech as a nod to my old Nishiki SunTour team. Electra Ticino wheelset with their sherrif star hubs. Look for the guy in the Nishiki/SunTour Montrose Cycle Club jersey. Water stops will be at the Santa Rita Road and Cypress Mountain Road summits. The Santa Lucia Route is slightly shorter (nominally 75 miles, 5700' of climbing, and 20 miles of gravel/dirt per EC; 73.2 miles · +5,712 ft / -5,713 ft per RideWith GPS). also has the additional dirt-and-gravel climb of Kiler Canyon that Santa Lucia riders will avoid. it looks as if there is a "bail-out" point on or near Santa Rita Road where tired or overmatched Via Dello Scalatore riders can opt for the less-demanding (Kiler-less) Santa Lucia Route. Last edited by mech986; 03-26-19 at 05:08 AM. Here's my ride this year, a 1987 Davidson Challenge. Last year I was on a 1988 Davidson Challenge that I liked so much that I bought another. The '87 has a slightly shorter seat tube and head tube and is built with the parts from the '88. The '88 is now sporting modern running gear. I'm signed up to do the long route again but I'll make a game time decision about that. I have a 300k the weekend before and a 400k the weekend after, so I may opt to dial it back a little. Wow, now that's a real workhorse of a bike. No nonsense. "Just the facts ma'am". Beautiful bike. I gather @brockd15 has had time to train this year:thumb. Cloudy with occasional rain showers. High around 65F. Winds S at 10 to 20 mph. Chance of rain 40%. Overcast with rain showers at times. Low 52F. Winds SSE at 5 to 10 mph. Chance of rain 40%. Considerable cloudiness with occasional rain showers. High 64F. Winds SSW at 10 to 20 mph. Chance of rain 50%. Cloudy with occasional rain showers. Low 51F. Winds SSE at 5 to 10 mph. Chance of rain 40%. Chance of a shower or two during the morning, followed by partly cloudy skies in the afternoon. High 67F. Winds W at 10 to 20 mph. Chance of rain 30%. A few clouds. Low near 50F. Winds N at 10 to 15 mph. Cloudy in the morning, then off and on rain showers during the afternoon hours. High 67F. Winds S at 10 to 20 mph. Chance of rain 40%. Friday night Considerable cloudiness with occasional rain showers. Low near 50F. Winds S at 10 to 15 mph. Chance of rain 40%. Showers early becoming less numerous later in the day. High 64F. Winds SW at 10 to 20 mph. Chance of rain 50%. A shower or two possible early with partly cloudy skies in the afternoon. High 68F. Winds W at 10 to 20 mph. Chance of rain 40%. SUN NIGHT APR 7 Partly Cloudy--47° 10% NNW 10 mph 84% Partly cloudy. Low 47F. WNW winds shifting to NE at 10 to 15 mph. So the routes could easily be wet or even muddy. Looks like a major challenge. Hope everyone come prepared for all eventualities and have stuff ready to clear much off the fork clearances. Let's hope the rain is sporadic or blows through quickly. Last edited by mech986; 03-28-19 at 03:37 AM. Well, the ride is supposed to be "heroic". I do know that rain can come down extremely hard in that area, but the forecast makes the rain (if there is any) seem sporadic, which is good. These forecasts are always subject to change though, I have better luck just looking at the Doppler radar loops the day I'm riding than believing forecasts, which only give you an idea what's possible, not what's actually gonna happen rain-wise. Here's to hoping for a minimum of "heroism" that day. Lemond, what do you think it would be like on Cypress mountain descent if it only had rained the day/night before? A few years ago, it had rained the Saturday before the event, and they altered the course to skirt by Kiler because they said it was muddy. Unfortunately, I don't know any of those climbs without actual road names. I was on the unpaved portion of Santa Rita Ranch Road last summer, and it was pretty dusty. Lots of people commute to work on that road during the week. Which leads me to believe there would be some mud if it rained. Still passable, but likely be more messy and inconvenient than anything. But arguably more "heroic". The pavement is also pretty bad, a lot of those roads are not very well-maintained at all, but that's to be expected. Be careful on some of the shoulders that have gotten washed out by the heavy rains this year, they can be much more dangerous than you might expect. Takes forever for roads in CA to get fixed, much longer than you would expect in a place that's surrounded by such expensive houses. The year they avoided Kiler it was because it was completely impassable to even 4WD vehicles due to mud. Based on my experience a few years ago at Eroica Gaiole, be sure to bring a plastic bag to cover both the top and bottom of your leather saddle. I didn't and my saddle was completely ruined by the spray coming up from the back wheel (not to mention that everybody on that ride got completely drenched and covered in brown mud). I had to periodically use sticks to clear the mud from around the stays and forks when the buildup became so great that the wheels stopped turning. Hopefully we won't get into conditions that bad in Cambria/Paso. I’ll go out on a limb and predict the rain is called off by the time we get there and the dirt will be in excellent shape (slightly soft and not dusty). roads will be crap, but that’s everywhere in CA. . Solvang a few weeks ago should rightly be sold as a cobble ride. Plus, we have all day to get muddy, ride our old bikes, and have fun. (not to mention that everybody on that ride got completely drenched and covered in brown mud). I had to periodically use sticks to clear the mud from around the stays and forks when the buildup became so great that the wheels stopped turning. Hopefully we won't get into conditions that bad in Cambria/Paso. Can't use fenders in that mud?